It was an absolute pleasure today to welcome Inner West non-government organisations to my Electorate Office in Marrickville for a morning tea and open day. 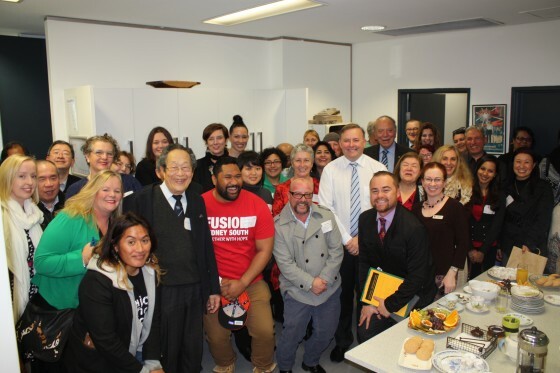 More than 40 people from community organisations, welfare services and charities joined me for a cup of coffee and a chat. Each day my Electorate Office helps locals who are doing it tough. Whether it is a problem with Centrelink or immigration, or needing advice on where to go for financial assistance, my office is there to assist. Today’s open day also shone the spot light on the extraordinary work Inner West NGO’s undertake. Each day they work hard to ensure the most vulnerable in our community are supported. It was good to meet so many passionate people committed to improving the lives of others in the Inner West. Today was also a great opportunity for all involved to learn more about each organisation’s work.